I spent the week of February 7th in the Dominican Republic and Haiti helping with the earthquake relief effort. I joined the Foundation for Peace in one of their weekly trips to Jimeni, a small town on the Dominican Republic side of Hispa�ola. There was a hospital which was being used solely for the earthquake survivors. This hospital was well staffed with doctors and nurses during my time there so I chose to travel to the refugee camps on the Haitian side of the border to help out. On Tuesday morning, I drove an hour to the refugee camp called "Love a Child" which housed many patients who required long-term care. This camp held approximately 200 patients and family members with only one working shower. My first day was spent helping build five wheel chair accessible shower stalls out of wood and tarps. As soon as we finished the project, Haitians rushed into the stalls to have private bucket showers. That afternoon we travelled back to the Jimeni Hospital to help transport patients in and out of the Operating Room for scheduled surgeries. On Wednesday, I took on a rather daunting project of sorting medical supplies at both the Jimeni Hospital and Love a Child refugee camp. In both places, there were boxes full of miscellaneous medical supplies. It was virtually impossible for doctors and nurses to find specific supplies without fishing through numerous boxes. Therefore, a few volunteers and I sorted supplies based on use in a hospital setting. My background as an Emergency Department Technician was extremely useful in this situation. By the end of our time there, the boxes were labeled and organized in a fairly useful manner. My third day in the refugee camp was spent meeting patients and administering wound care. Most patients had severe wounds, amputations, and broken bones held together by external pin apparatuses. Care in this environment was unlike any I have given before due to environmental elements and widespread malnourishment. It was very difficult to keep wounds clean and covered in a 90 degree, dusty environment outside in tents. 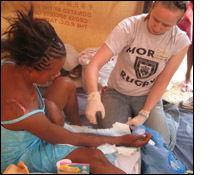 I spent the day meeting Haitians in their tents and listening to their stories while administering wound care. With a translator's help, I spoke with one man who told us about his life in Port au Prince and the family he was so proud of. I met his son and nephew. He sincerely thanked me for coming to talk with him. He said that this was the first time he has felt human since the earthquake hit. He had been told where to go and what to do for weeks and hardly talked with anyone. The short time I spent with him made him smile and remember his humanity.